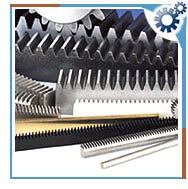 Rack gear is a toothed bar into which a pinion meshes. Racks are gears of infinite pitch radius. They are used to translate rotary motion to linear motion or vice versa. They will mesh with pinions of the same pitch. Racks are made of various materials. The commonly used materials for racks are stainless steel, brass, and plastic. They are widely used in automobiles. The steering wheel of a car rotates the gear that engages the rack. The rack slides right or left, when the gear turns, depending on the way we turn the wheel. Windshield wipers in cars are powered by a rack and pinion mechanism. They are also used in some scales to turn the dial that displays weight.